They stand like giants, breathing smoke into the atmosphere, tall and seemingly indomitable. Yet all things on this earth have a lifetime, and chimneys are no different. And when it comes to their demolition, the old maxim rings true: the bigger they are, the harder they fall. Triggered by a controlled explosion, the destruction of towering chimneys takes mere seconds, but precise planning is key. Any materials that might scatter too far are removed, and the explosives are strategically placed and covered to ensure the smokestack or cooling tower collapses into its own footprint, or falls like a tree without potentially deadly debris missiles flying through the air. Still, despite the latent danger of chimney implosions, they are thing of wonder; the sight of these monumental relics of the industrial age crashing to the earth with a deafening rumble is something to behold. Onlookers might be said to be brave – even steadfast neighboring structures have been damaged when miscalculations occur – but something captivates us about the beauty that lies in destruction. 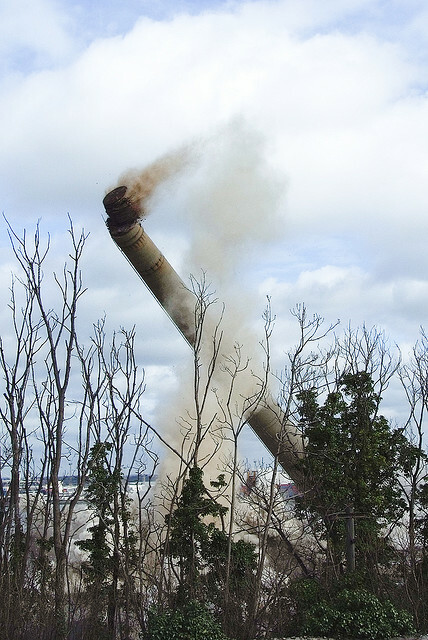 Here are ten incredible snapshots of chimney demolitions as they happened. 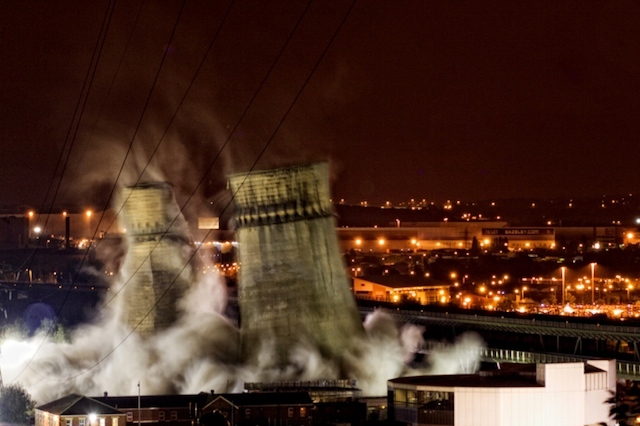 This shot captures the instant the Tinsley Towers, two landmark concrete cooling towers in South Yorkshire, England were razed in 2008. Thousands turned up to witness a demolition unique in the fact that it occurred just feet from a viaduct whose upper deck supports the M1 motorway. Unsurprisingly, this major road artery was closed the night the 250-feet-tall (76 m) industrial chimneys were blown to dust after 70 years of service – although one of the towers stayed partially standing before later crumbling in. Despite efforts to save the so-called ‘salt and pepper pots’ – the last remains of Blackburn Meadows Power Station – the site is earmarked to become a biomass power station. 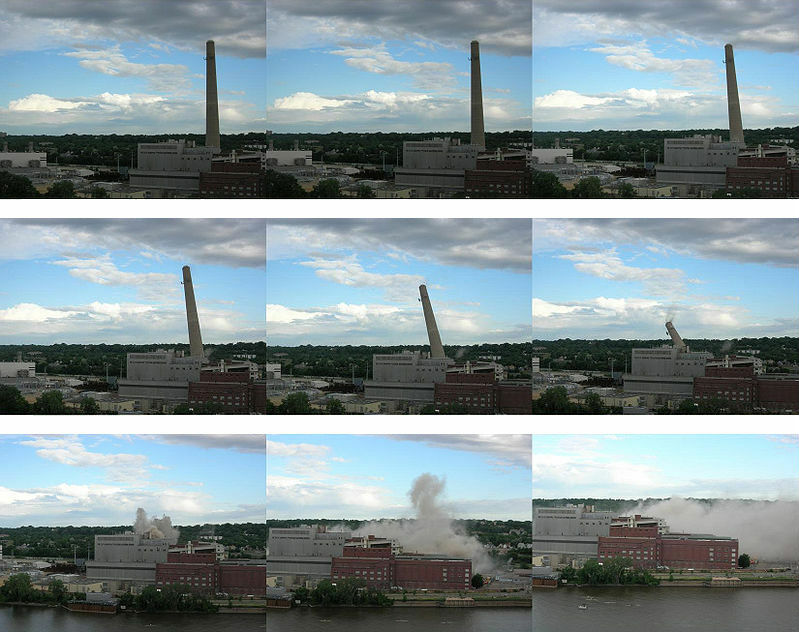 This sensational time-lapse composite image shows the successive moments in which a soaring smokestack crumples to its knees – an explosion detonated two thirds of the way up the structure at a critical point, enough to make its bottom half collapse in on itself under the tremendous weight of the bricks falling from above. In such demolitions the explosives are but the catalyst for the destruction; the mighty collision caused by gravity’s pull does the damage which brings the stack down. This once proud chimney was blasted to rubble in 2006 at the site of the former Henninger Brewery – said to be one of Frankfurt’s best beer makers and now owned by the Radeberger Group. 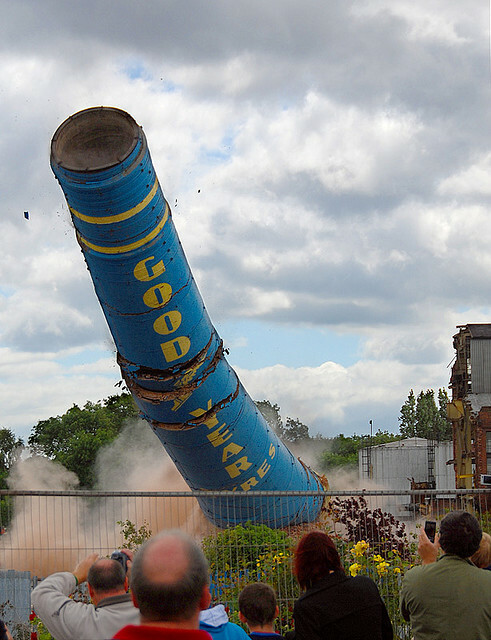 When the Goodyear chimney in the English industrial city of Wolverhampton was demolished in 2008, hundreds of onlookers watched as the iconic regional landmark met its demise. The 180-foot (55 m) chimney was blown up at the base in a controlled explosion, and the local press noted how, with it, eight decades of history “came crashing to the ground.” The property developers said at the time that the smokestack had become “structurally unsafe,” with the tire factory on which the stack stood slated to make way for housing. A PR exercise had a former factory worker and local pupil pressing the firing button that saw the chimney reduced to a heap of debris and twisted metal. Above is a spectacular photo of the cooling tower at Oregon’s Trojan Nuclear Power Plant smashing to earth, with dust and debris spewing from the dynamite explosion. Watched by thousands, the 499-foot-tall (152 m) cooling tower – visible from Interstate 5 in Washington – was demolished in 2006, after a short but controversial lifetime. The power plant only existed for 16 years before being prematurely closed. During that time it faced opposition from environmentalists and was also found to have major construction errors which eventually saw it shut down in 1992 after a series of dangerous steam tube leaks. 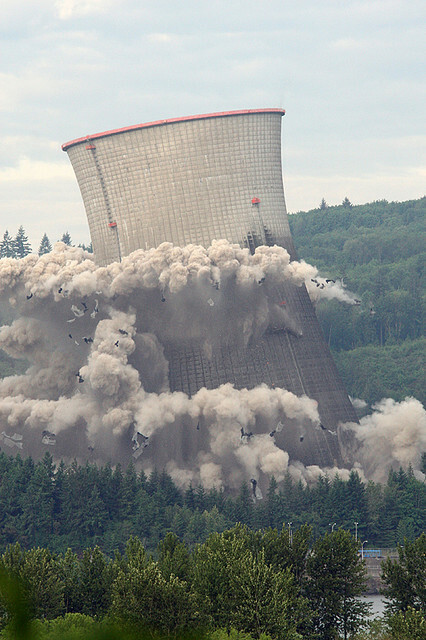 It was the first implosion of a nuclear plant cooling tower in the US. 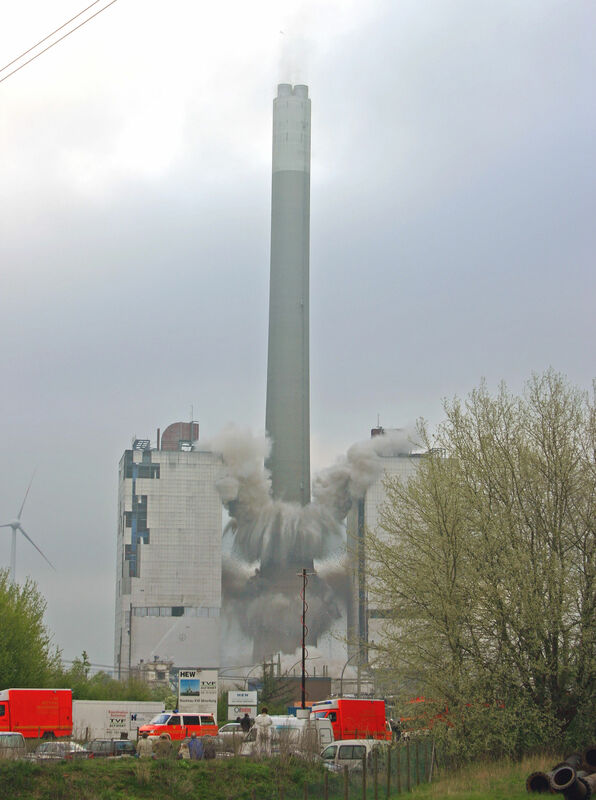 With a plume of smoke appearing to escape from its flue, this falling stack seems to be exhaling its last breath as it crumples to earth. The destruction of the colossal 15,000-ton chimney – which at 839 feet (256 m) was among Hamburg’s tallest structures – took place in 2004. It was demolished using explosive charges fixed at three levels (ground and heights of 208 and 298 feet). The massive force of the blast blew off the ventilation grill from one of the boiler houses, which flew into an adjacent building, causing a short circuit and a consequent blackout in parts of the city plus an emergency shutdown and loss of production for several days in nearby oil refineries. Moorburg was closed down partly due to rising natural gas prices, and a coal power plant has since filled its shoes. 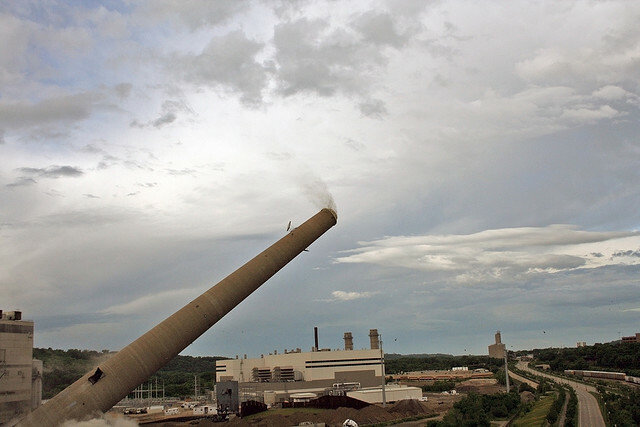 “The 570-foot (174 meter) tall smokestack from the Xcel Energy High Bridge power plant is seconds away from being history,” reads the caption for this awe-inspiring photo. This towering man-made monolith was demolished in 2008, with the loud boom greeted by much cheering from the 5,000-strong crowd there to watch the event. Explosive charges were used to topple the 5,770-ton behemoth, bringing it crashing down onto heaps of dirt designed to absorb the shock of the fall. 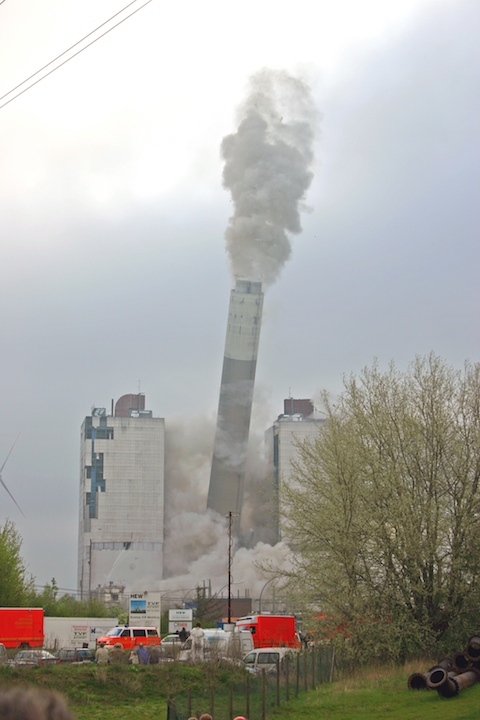 The stack’s coal burning power plant, located in Saint Paul, Minnesota and originally constructed in 1923, was torn down, ready to be replaced by a new natural gas plant set to significantly reduce emissions. A shot that makes you want to cry ‘Timber!’ – this next example of photographic timing shows one of the chimneys that overlooked the town of Northfleet, Kent as it was felled like a tree. Dozens of spectators looked on as the 550 feet (168m) twin towers, which had dominated the local skyline for 40 years, slowly toppled. 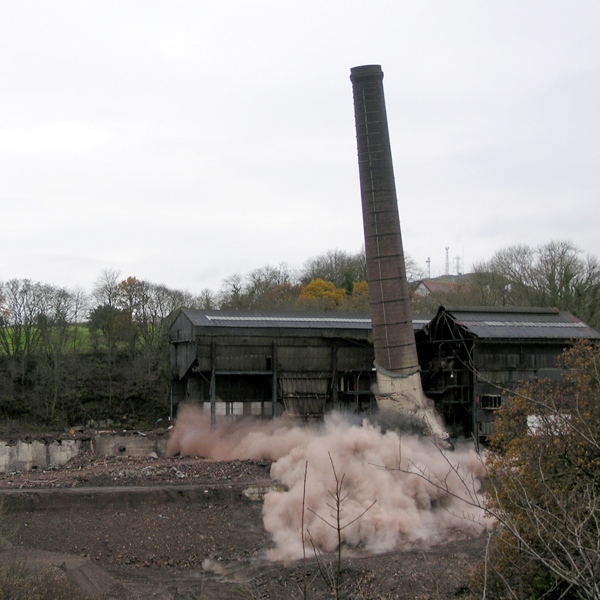 Dust streamed from the funnels, before the chimneys disintegrated in a cloud of dust, as water jets were aimed at them by workers on the ground. The toppling of the two smokestacks in 2010 was the final nail in the coffin for two centuries of cement production at Northfleet, with the former Lafarge Cement works site set to become a mixed use development. Time seems to freeze for an instant before the boiler house chimney in Denny’s Carrongrove Paper Mill collapses into its own billowing dust cloud. With a massive chunk blown out of the base of the structure by the force of the blast, the next few seconds saw the chimney buckle and tilt to one side, crushing itself under its own weight. For photographer Nigel J C Turnbull, the fall of this giant in 2009 symbolized, “The end of the papermaking era” in Stirlingshire, Scotland. The controlled explosion was was one of the final acts in the demolition of a site that will soon be redeveloped into housing. The mill was closed in 2005 following a sharp industrial decline in the region. 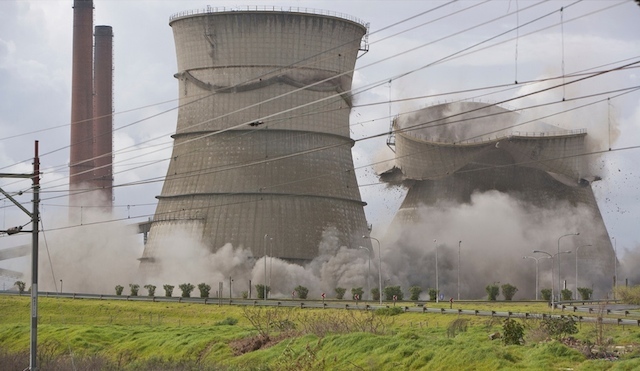 Letting off a tremendous boom, South Africa’s Athlone Cooling Towers were destroyed using dynamite charges in 2010. The 262-feet (80 m) high concrete structures, known locally as the ‘two ladies of Athlone,’ were downed in less than ten seconds amid loud cheering from the thousands of Cape Town residents who had gathered. The two iconic towers, commissioned in 1966, were decommissioned in 2003 – declared unsafe after one of the structure’s support rails gave way. Located along the busy N2 highway, the buckling tower posed a serious risk to motorists. Controlled implosion was deemed the solution, though the power station is set to be redeveloped. 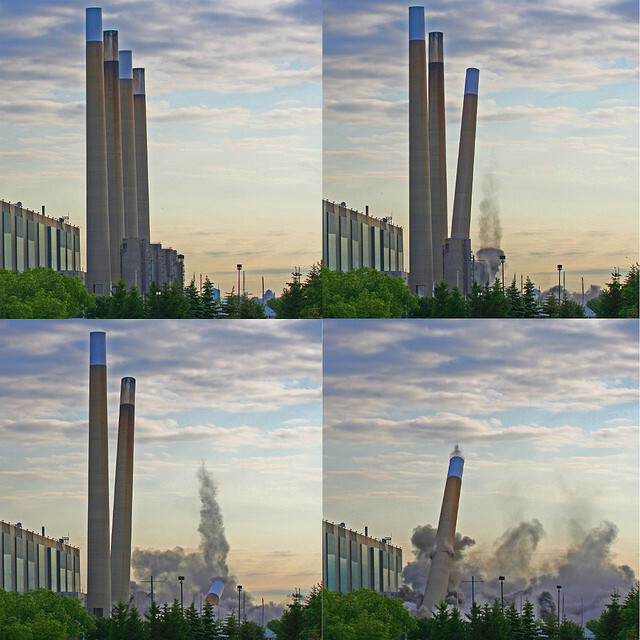 Entitled 4-3-2-1, this wonderful image preserves the successive moments in which the smokestacks of Mississauga’s Lakeview Generating Station came tumbling down in 2006. Every few seconds, one after another, the monoliths disappeared into their own dust cloud emitting a thundering bellow. Known as the ‘Four Sisters,’ the stacks had stood tall for forty years, icons of what was once the largest coal-fired station in the world. The demolition team had to wait days for the wind to blow in the right direction – out over the lake and away from residents – before the charges were detonated that brought the columns down. The 493-foot (150 m) structures were the tallest ever imploded in Canada. The chimneys of the former Blyth power station in North East England were leveled in 2003 in what is said to have been the largest such demolition in half a century. The four 17,000-ton, 460-ft (140 m) structures had dominated the coastal skyline for over four decades before crashing to oblivion, rocked by explosions that saw them teeter then fall in sequence like toy soldiers. People had to move from their houses as over 300 lbs of high explosives were placed at the feet of the reinforced concrete, brick-clad chimneys, and it was only from a safe distance that spectators heard the air raid siren which presaged the power station’s death throes. A piece of the region’s history was finally laid to rest.